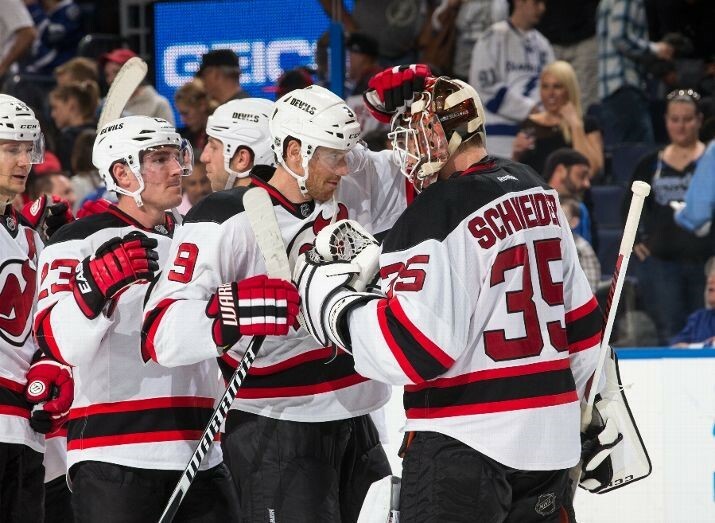 The Devils came into Tampa well aware of the challenge that laid before them. Tampa came off of a blowout victory against a Canadiens team many believe is a serious Stanley Cup contender. The Devils did have a slight advantage over the Lighting coming into the game. Tampa started their backup Nabokov in goal because the Lightening were playing their second game of back to backs. Even so I wasn’t expecting this to be an easy game. The first period Tampa came out with tons of energy and looked to carry momentum over from their previous night blowout. Schneider looked great and was up to the challenge stopping all 11 shots that he saw in the first period. About halfway through the first the Devils began to pick up their game and match intensity with the Lightening. Nabokov answered Schneider by stopping all 9 shots that he faced in the first. At the end of the period Marty Havlat took a hooking penalty that set Tampa up on the power play. The Lightening carried 1:44 of power play time over to start the second period. Although Tampa started the second on the power play, Brenden Morrow took an interference call with 11 seconds left on the power play. Both goalies seemed up to the task stopping all shots until 7:38 of the second period. Travis Zajac would net his first goal and his first point on the year, from Andy Greene and Mike Cammalleri. With New Jersey taking to momentum, Victor Hedman would get called for holding the stick and put the Devils on the power play at 10:43. With nothing amounting from the power play the Devils ended the second period up 1-0. Schneider stopped all 9 shots he faced in the second period and all 20 he faced in the game from Tampa. Tampa came out in the third ready to take momentum back and seemed determined to tie the game. Schneider continued his outstanding play into the third and made many key saves throughout the third. The Lightening’s persistence and offensive prowess finally paid off at 8:59 of the third when Alex Killorn scored on a trickler that found its way through Schneider’s pads and through his legs. Killorn’s third period goal was his first of the year, assisted by Tyler Johnson and Anton Stralman. Less than a minute after scoring, Steven Stamkos took a hooking penalty at 9:56 of the third. That penalty proved to be costly when Mike Cammalleri netted his 4th goal of the season at 11:19, from Patrik Elias and Marty Havlat. Cammalleri camped out at the far post and took a shot pass from Patrik Elias to score on a wide open net. The Devils hung on to win the game as Nabokov went to the bench to finish the game. There is no doubt that this was a huge statement game for the Devils in this young season. All phases of the game clicked for the Devils. Schneider was outstanding and have raised his season numbers to impressive levels. The power play, although only being 1-4, came through when it was necessary. And the penalty kill did the job against a high powered offense. The Devils also won the faceoff battles and out hit Tampa. 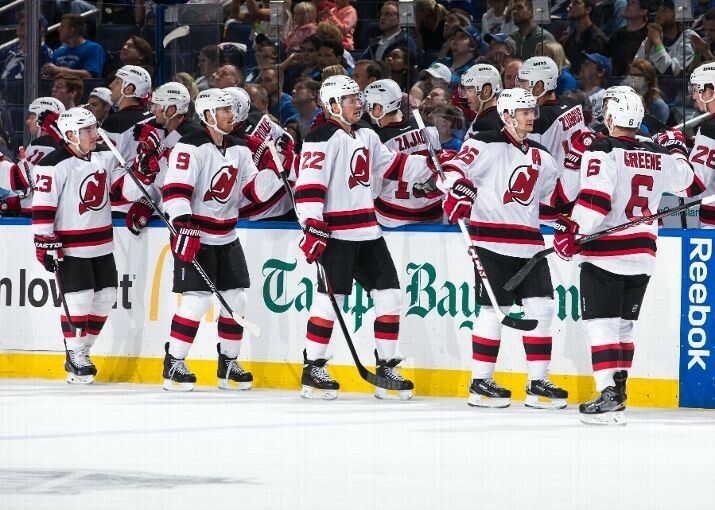 Although it still is only 3 games into the season this was a serious test for the Devils and they passed, in impressive fashion. They shut down Steven Stamkos, who boasted a hat trick from the night before. If the Devils can carry this momentum with them into Washington and beat another formidable opponent, their home opener at the Rock will be a great experience. The next three games are going to be crucial for the Devils. They have Washington, San Jose, and the Rangers in the next week. If the Devils can win 2 out of those 3 or even take all three, the Devils will turn a lot of heads in the league and will put the league on notice not just the Eastern Conference.